Getting your baby to sleep soundly and consistently can be very frustrating for new parents. Newborns sleep most of the day and wake to feed every few hours–daytime or nighttime. Plus, babies’ sleep cycles change as they get older: they begin sleeping for longer periods at night or take naps during the day. 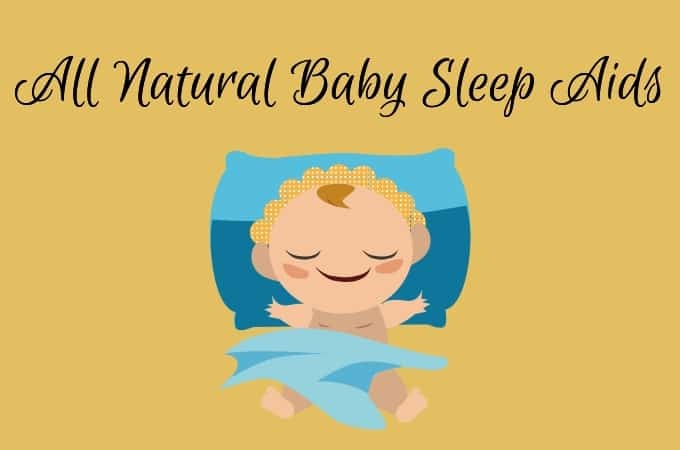 If you want your baby to sleep well no matter what their current sleep cycle is like, there are plenty of natural baby sleep aids you can use to help. But they’re not the sort of sleeping aids you might be thinking of. One of the most helpful sleep aids parents can use is a bedtime routine. A regular bedtime routine of quiet, soothing activities can help babies wind down and prepare for sleep. Make the room Dark. Very dark. Your little one is newly developing their understanding of sleep and they need the sleep space to me pitch black to support their very newly developed circadian rhythms. Set a bedtime and stick to it. Pick a time that works for your family and be consistent every night. This will help build a healthy association to the sleep space and keep calm for your infant as sleep rapidly changes in the first year. Bedtime stories or lullabies. Unlike other children’s books that are meant for learning or stimulation, bedtime stories are rhythmic and repetitive. Think of the children’s classic Goodnight Moon. The structure of the story is mesmerizing and can help baby feel drowsy. Gentle rocking or gliding in a chair. Many babies relax and fall asleep when being rocked or held in a chair. However, other babies find it too stimulating. Since all babies are different, see if rocking or gliding is soothing enough to use as a sleep aid for your baby. Setting a bedtime routine can be relaxing for baby and parents. When used in conjunction with a soothing environment, your baby can learn to fall asleep quickly and soundly. Think of your bedtime routine as a communication to your baby as well as a start to the night( the morning routine will be an equal/ opposite as a stop to the night). This creates very healthy and calm associations to the sleep space and night for great sleep. Think of how you prefer to keep your bedroom at night. To help you fall asleep quickly, you probably keep it dark, quiet and cool. Do the same for your baby’s nursery to encourage them to fall asleep. When bedtime draws near, avoid artificial light, especially blue light. Blue light, emitted by high-efficiency light bulbs, smartphones, computers, and tablets, delays the release of melatonin, which helps bring about drowsiness and relaxation. Use curtains to block natural light, and use light bulbs that emit soft light or filter out blue light. Try to only use Red lights in a sleep space. In contrast, exposing your baby to natural light during the day can help their sleep cycles get in sync. A walk outside in the daytime or playing in an area with lots of natural light can give their internal clock a gentle nudge towards normal sleeping times. Finally, consider using baby sound machines or comforting objects. When used responsibly and not too loudly, white noise machines or baby sound machines can influence your baby’s brain waves. Much like the soothing rhythm of a bedtime story, the muffled sounds from a sound machine can encourage your baby to fall asleep. Along with a sound machine, a comforting object like a pacifier or lovey can help babies relax and feel safe. Just be sure to keep soft objects like pillows or blankets out of their crib, which can be safety hazards to young babies. Dress your baby accordingly. Don’t cover their head, and dress them in pajamas or sleepers that will keep them warm enough–but won’t make them overheat. Try a wearable blanket as an additional warm layer if needed, which can’t be kicked off or cover a baby’s head like loose blankets can. Keep baby close by with a bassinet or cradle. These classic small beds on wheels can be kept in your room nearby and is a safe alternative for parents who prefer co-sleeping. Having your baby near can make nighttime feedings easier, and provide reassurance to both baby and parents. This is also only for a time period and when your baby is ready to graduate out of your space the transition can be very easy. Remember in the first year things change a lot and we have to be ready to grow with baby. Use a baby monitor. With a monitor, you can check on your baby from elsewhere in your home, and avoid going into their room if unnecessary. A baby monitor is especially helpful if you are using sleep training methods that involve intervals of time spent soothing a fussy baby. Give these natural baby sleep aids a try, but don’t feel discouraged if your baby doesn’t respond to certain methods. All babies are different; what may feel soothing to one baby may not work for yours. Contact us if you need more help choosing an all-natural sleep aid for your baby. Previous: Baby Sleep Training Methods: Which One is Right for You?